(TORONTO, ON. – October 27, 2014) Roll up your sleeves and get to work, confident that your pick-up truck is up to the task. With impressive towing capability plus a choice of engine sizes, drivetrains, cab sizes and bed lengths – all generously equipped for performance, comfort and safety – the 2015 Toyota Tundra is the full-size pick-up that’s ready for any project. The 5.7L i-FORCE V8 cranks out 381 peak horsepower and up to 401 lb-ft of torque. The 4.6L i-FORCE V8 delivers improved fuel efficiency while still producing up to 310 HP and 327 lb-ft of torque. All models feature a Six-Speed Super ECT transmission with Sequential Shift Mode for smooth shifts and maximum efficiency. The 4x2 drivetrain boosts fuel efficiency while offering the best towing capacity possible. 4x2 Models feature Traction Control and an Auto Limited Slip Rear Differential. The 4x4 drivetrain delivers superior traction and performance under all weather and terrain conditions. 4x4 models feature Active Traction Control, an Auto Limited-Slip Rear Differential, and One-Touch 4WD to seamlessly switch into and out of 4WD mode. • Regular (3 person), Double Cab (up to 6 person) or CrewMax (5 person): Pick the cab size that suits your needs and desired levels of comfort. An 8.1-foot bed on select models can accommodate full-size sheet goods with ease. Other models feature 5.5-foot or 6.5-foot beds to balance carrying capacity and interior cab space. All Tundra models are very generously equipped with standard comfort, convenience and safety features that raise the bar in the full-size pick-up truck segment. These include: Toyota’s latest Display Audio system with touchscreen interface and Bluetooth capability; air conditioning; backup camera; Direct Tire Pressure Monitoring System; easy lower and lift, removable and locking tailgate; and the six active technologies of Toyota’s Star Safety System. This model delivers an impressive 4,760 kg (10,500 lb) towing capacity plus the cargo-loading versatility of an 8.1-foot bed – long enough for full-size sheet goods. This model may be ordered with the available SR5 Package, which adds: a larger, 7” display for the audio system, plus XM Satellite Radio, advanced voice recognition; power door locks with keyless entry; power windows and rear privacy glass; cruise control; chrome exterior accents; dual illuminated vanity mirrors; variable intermittent wipers; upgraded interior trim; and more. This Tundra handles crew and cargo with ease, with seating for up to six, a 6.5-foot bed, and the efficient yet powerful 4.6L i-FORCE V8 that delivers a 3,080 kg (6,800 lb) towing capacity. A generous set of standard features include: a larger, 7” display for the audio system, plus XM Satellite Radio, advanced voice recognition, and more; power door locks with keyless entry; power windows with rear privacy glass; cruise control; dual illuminated vanity mirrors; variable intermittent wipers; and more. This model may be fitted with the SR5 Plus Package, which includes: Telescoping steering column; 18” aluminum alloy wheels; bucket seats; eight-way power adjustable driver’s seat; bed-rail system; tie-down cleats; fog lamps; rear bench seat with under-seat storage system; front centre console box; and more. With its combination of a 5.7L i-FORCE engine and Toyota’s legendary 4x4 capability, this model is a force to be reckoned with. This model features a 4,625 kg (10,200 lb) towing capacity, plus the cargo-loading versatility of an 8.1-foot bed. With seating for three, it’s generously equipped and ready to work. This model may be ordered with the available SR5 Package, which adds: a larger, 7” display for the audio system, plus XM Satellite Radio, advanced voice recognition, and more; power door locks with keyless entry; power windows and rear privacy glass; cruise control; chrome exterior accents; dual illuminated vanity mirrors; variable intermittent wipers; upgraded interior trim; and more. With 2,945 kg (6,500 lb) towing capacity, a 6.5-foot bed and seating for six, this model is capable and versatile – packing a potent mix of power and efficiency into an aggressive and sophisticated package. Standard features include: 60/40 split fold-up rear seats; power door locks; power windows; and more. The SR5 Package adds: a larger, 7” display for the audio system, plus XM Satellite Radio, advanced voice recognition, and more; a rear bench seat with under-seat storage; rear privacy glass; keyless entry; chrome exterior accents; dual illuminated vanity mirrors; upgraded interior trim;; and more. The SR5 Plus Package builds on this, adding: Telescoping steering column; 18” aluminum alloy wheels; bucket seats; eight-way power adjustable driver’s seat; bed-rail system; tie-down cleats; fog lamps; front centre console box; and more. The TRD Off-Road Package builds on this, adding: Fuel tank protector plates; Bilstein shock absorbers; all-terrain tires on 18” Off-Road aluminum alloy wheels; an audio system enhanced with the Bongiovi Acoustics Digital Power Station; power sliding rear window; garage door opener; clearance and back-up sensors; auto-dimming rear view mirror with compass; anti-theft system; manual headlamp leveling system; heated seats; and more. With a 4,490 kg (9,900lb) towing capacity, a 6.5-foot bed and room for six, this model combines powerful performance with an impressive range of innovative technical features – equally at home on the job site or the trail. Standard features include: 60/40 split fold-up rear seats; power door locks; power windows; and more. The SR5 Package adds: a larger, 7” display for the audio system, plus XM Satellite Radio, advanced voice recognition, and more; a rear bench seat with under-seat storage; rear privacy glass; keyless entry; chrome exterior accents; dual illuminated vanity mirrors; upgraded interior trim; and more. Don’t mess around: this model is perfect for big jobs. It features loads of space with an 8.1-foot bed and room for six, plus plenty of muscle – including a 4,445 kg (9,800 lb) towing capacity. Standard gear includes: a larger, 7” display for the audio system, plus XM Satellite Radio, advanced voice recognition, and more; a 60/40 fold-up rear bench seat with under-seat storage; foot-well lighting; rear privacy glass; variable intermittent wipers; keyless entry; and more. This model may be fitted with the SR5 Plus Package, which adds: Telescoping steering column; 18” aluminum alloy wheels; bucket seats; eight-way power adjustable driver’s seat; bed-rail system; tie-down cleats; fog lamps; front centre console box; and more. Powerful style with performance to match, this new model for 2015 features a 4,490 kg (9,900 lb) towing capacity, a 6.5-foot bed and room for five. Inside, the sophisticated and comfortable cabin is packed with convenience features, making this a welcome partner for any task. Specially-equipped for off-roading, this model includes exclusive features such as 18” TRD off-road wheels clad with all-terrain tires, a front and rear suspension enhanced with Bilstein shocks, and TRD off-road decals, plus a storage tray under the rear seat as standard. Other standard gear includes: a larger, 7” display for the audio system, plus XM Satellite Radio, advanced voice recognition, and more; dual-zone automatic climate control; a 60/40 fold-up rear bench seat; eight-way power adjustable driver’s seat; leather seating; heated front bucket seats; auto-dimming rear view mirror with integrated compass; foot-well lighting; illuminated ignition key cylinder; power windows, including a power sliding rear window; privacy glass; soft-touch interior door trim; woodgrain and soft-touch dashboard trim; front centre console box; garage door opener; clearance and back-up sensors; keyless entry; anti-theft system with glass breakage sensor; automatic headlamp system; manual headlamp leveling system; fog lamps; leather-wrapped steering wheel; telescoping steering column; bed-rail system; tie down cleats; and more. This model may also be ordered in a different configuration, enhanced with the Technology Package. This package trades in the TRD off-road look and exclusive features in favour of a more premium stance that has 20” aluminum alloy wheels and additional Toyota technology systems, including: Premium Navigation; Blind Spot Monitor System; Rear Cross Traffic Alert; and more. Step inside the CrewMax cab and discover what comfort really feels like – with plenty of room for six, or fold up the rear seats for lots of cargo space. With a 5.5-foot bed and 4,445 kg (9,800 lb) towing capacity, this model is also loaded with many comfort and convenience amenities, including: a larger, 7” display for the 9-speaker audio system, plus XM Satellite Radio, advanced voice recognition, and more; power door locks; dual illuminated vanity mirrors; foot-well lighting; power windows, including a power vertical sliding rear window; privacy glass; soft-touch door trim; keyless entry; cruise control; and more. The SR5 Plus Package adds: Telescoping steering column; 18” aluminum alloy wheels; bucket seats; eight-way power adjustable driver’s seat; bed-rail system; tie-down cleats; fog lamps; front centre console box; and more. The TRD Off-Road Package builds on this, adding: Fuel tank protector plates; Bilstein shock absorbers; all-terrain tires on 18” Off-Road aluminum alloy wheels; an audio system enhanced with the Bongiovi Acoustics Digital Power Station; power sliding rear window; garage door opener; clearance and back-up sensors; a power moon roof; auto-dimming rear view mirror with compass; anti-theft system; manual headlamp leveling system; heated seats; and more. Step in, and step up to a wealth of comfort and convenience features. With a 4,345 kg (9,579 lb) towing capacity, a 5.5-foot bed, and comfortable seating for five, plus Toyota’s legendary 4x4 capability and a 5.7L i-FORCE V8, this new model for 2015 will get you and your crew – and your cargo - wherever you need to be. Specially-equipped for off-roading, this model includes exclusive features such as 18” TRD off-road wheels clad with all-terrain tires, a front and rear suspension enhanced with Bilstein shocks, and TRD off-road decals, plus a power tilting/sliding moon roof as standard. Other standard features include: a larger, 7” display for the 9-speaker audio system, plus XM Satellite Radio, advanced voice recognition, and more; dual zone automatic climate control; 60/40 split fold-up rear seats; heated front seats; leather seating; an eight-way power adjustable driver’s seat; power door locks; auto-dimming rear view mirror with integrated compass; foot-well lighting; illuminated ignition key cylinder; dual illuminated vanity mirrors; power windows, including a power vertical sliding rear window; privacy glass; woodgrain and soft-touch dashboard trim; front centre console box; variable intermittent wipers; automatic headlamp system; manual headlamp leveling system; fog lamps; leather-wrapped steering wheel on telescoping steering column; bed rail system; tie-down cleats; garage door opener; keyless entry; cruise control; anti-theft system with glass breakage sensor; and more. This model may also be ordered in a different configuration, enhanced with the Technology Package. This package trades in the TRD off-road exclusive features in favour of 20” aluminum alloy wheels and additional Toyota technology systems, including: Premium Navigation; Blind Spot Monitor System; Rear Cross Traffic Alert; and more. Style and strength fit together like a hand in a glove in this bold and capable pick-up truck. With a 4,305 kg (9,490 lb) towing capacity, a 5.5-foot bed and room for five, this model features premium black leather seating and dash trim with a luxurious diamond-stitched design, chrome accents, unique 20” aluminum alloy wheels, and more – much more. Standard features include: A premium 12-speaker JBL audio system with 7” display screen, advanced voice recognition, and more; AVN Premium Navigation; dual zone automatic climate control; 10-way power adjustable driver’s seat with memory system; four-way power adjustable front passenger’s seat; heated and ventilated front seats; auto-dimming rear view mirror with integrated compass; power door locks; foot-well lighting; illuminated ignition key cylinder; dual illuminated vanity mirrors; power windows, including a power vertical sliding rear window; privacy glass; chrome cabin accents and exterior details; the Blind Spot Monitor System; Rear Cross Traffic Alert; a power moon roof; the automatic headlamp system; manual headlamp leveling system; fog lamps; power adjustable and heated mirrors linked to the driver’s seat memory system; leather-wrapped steering wheel on telescoping steering column linked to driver’s seat memory system; bed rail system; tie down cleats; a spray in bed liner; and more. This model may also be ordered as the 1794 Edition, featuring: Woodgrain and leather-wrapped steering wheel and shift knob; 20” chrome clad alloy wheels; premium saddle tan brown leather seating with suede accents; chrome steel front bumper ends; chrome grille surround; unique badging; an exclusive exterior colour (Sunset Bronze Mica); and more. 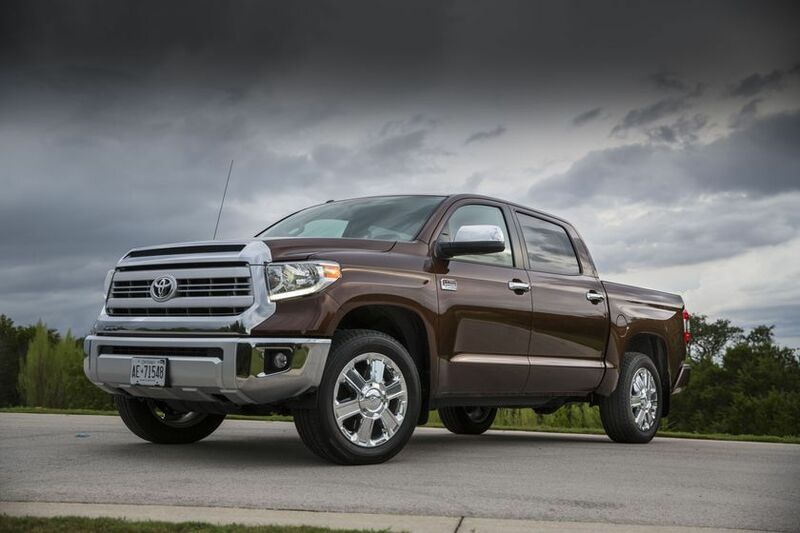 The 2015 Toyota Tundra is now on sale at Toyota Dealers across Canada. For more information on features and specifications, visit www.toyota.ca/tundra.